4/23/19: Hey guys! It's Dolly, formerly Grammy! A whole week ago I went on this crazy long ride in a whole bunch of cars and finally made it to my foster home. Man, I sure am living the good life! I'm there with Porter, formerly Gramps. He came with me on my trip. Dozer lives here too, he is foster moms dog. He sure is a big guy but with slow introductions we've been doing pretty well together. I've got 2 furless sisters and a furless brother here and I absolutely love them. Foster mom says I need some meat on my bones and that I have to get over these yucky heartworms but that I'm just the sweetest old lady. I love to be with my humans and just cuddle up and take lots of naps. I have a whole lot of love to give and I give it all the time! I'll keep ya’ll updated! 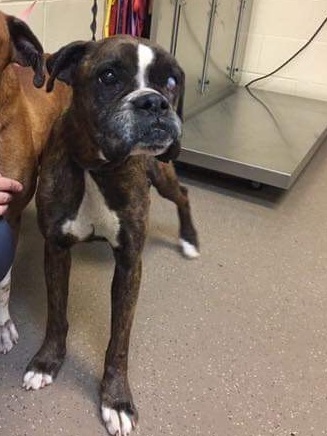 Dolly is a senior that came in with Porter.